I have read my fair share of YA Dystopian novels, most of which contain a female protagonist running from a suppressive regime. Fighting for the little guy, doing what's right. This book was a surprising relief from what I had learned to expect from this type of novel. Centered around Todd Hewitt (yes, that's right...a boy! ), The Knife of Never Letting Go pulls the reader into a world where all the women have died, Todd is the youngest member of society, and all the men can hear each other's "Noise". Basically everything they think, want to say, have said/seen in the past is constantly on show for the rest to hear. When Todd goes out into the swamp in search of apples he stumbles across something that he never thought he would ever find: silence. His world will never be the same again. Ben and Cillian, the only parent like figures he has ever known, force him to flee town and go on the run. For what reason, Todd does not know. Todd has to grow up quickly, even though according to his culture, he doesn't become a man for another 2 weeks. He struggles with his morals, loyalty and conscious battling things he thought he would never have to. This book is exciting, fast paced and somewhat un-put-down-able. 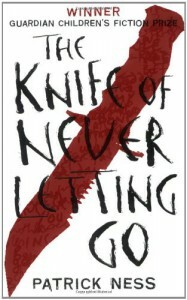 With tinges of romance and some gory action scenes The Knife of Never Letting Go is suitable for everyone. My favourite thing was his relationship between Todd and his dog Manchee. Did I mention that because of the Noise everyone can hear what animals are saying too? If that's not an incentive to read this book, I don't know what is. Has anyone else read the other two books in this series? I am really looking forward to starting them. I was definitely left on a cliff, hanging.